Are you baking in a dutch oven, or on a stone? If you have a dutch oven, give it a try, just so you can get a sense of what proper steaming will do for your crusts. Similar results can be had on a stone, but it helps to know what to expect. The beauty of a dutch oven is the bread steams itself while the cover is on. It is a bit of a hassle to get it into the pot cleanly. I place the bread on a well dusted peel, slash, put the preheated pot on the stovetop, peel next to it, then with two hands, quickly grab and drop. But generally I use a baking stone with an aluminum roasting pan over the loaves for the first 30m to get the same. Also, it seems like you could bake lover/hotter. My loaves are generally 800g-1k, but even somewhat smaller ones bake at 450 for nearly an hour; 30m under steam (covered or steamed), and 20-40m more until the loaves are good and colored. All good advice, but I had to wait until the weather cooled a bit, which coincided with my desire to create the 100% homemade BLT. 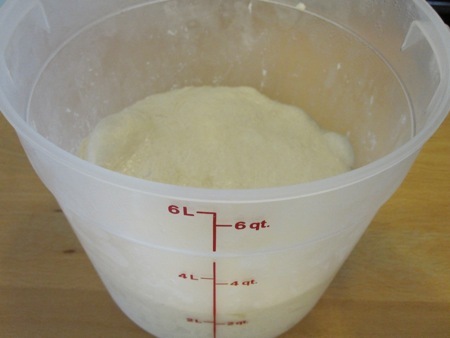 So, using the version 2 recipe, I filled another bucket full of dough that rested in the fridge for a day. 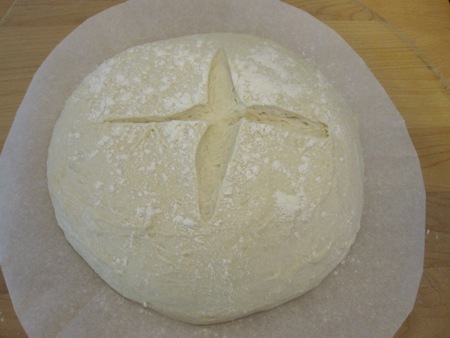 I weighed out a pound of risen dough, set it on a circle of parchment, gave it one more rise at room temperature, and slashed the top. 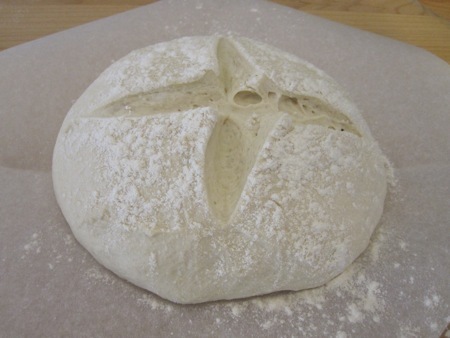 While the dough rose, I heated the oven to 450° F and let my covered seven-quart cast-iron dutch oven heat up as well. I dropped the dough – parchment and all – in the pot, covered it, and baked for twenty five minutes. I removed the cover and let the loaf bake for another twenty five minutes. 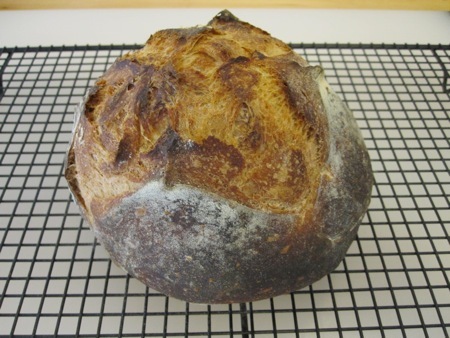 The crust was much darker than my previous efforts, but the loaf still had that almost spherical, blown-out appearance. It tasted fine, although I only tried it toasted in a BLT, and not by itself. I tried to figure out what might have gone wrong – too much flour on the surface? slashed too deeply? – when it hit me: the loaf is too small, the ratio of surface area to volume is wrong. It’s a hypothesis that was easy enough to test. 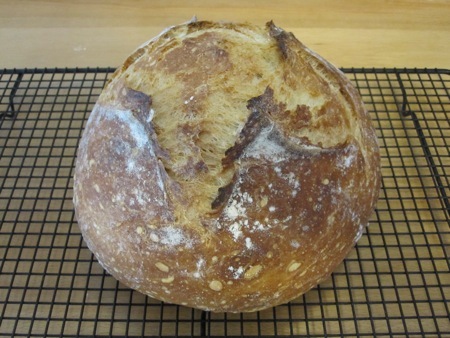 I used the remaining two pounds of dough to make the next loaf, keeping the rest of the variables the same. After a forty minute rise, I dusted and slashed the new loaf. It’s hard to tell from the foreshortening in the photo, but this version was much less spherical, as you can see in the cross-section photo at the top. You can also see that it was fairly dense, with a good even distribution of air bubbles throughout. Unfortunately, it was a bit chewier than I would have liked, although it will make excellent toast. I’ve modified my hypothesis, and will repeat recipe one more time, splitting the dough into two equal pound-and-a-half loaves. If that doesn’t work, I’ll have to call in an expert to show me how it’s done. This bread-baking business is much more finicky than I ever imagined.